Are you temporarily or permanently disabled, have mobility issues or do you have an elderly relative who is dependent on the family members? Or, are you pregnant and having problems with bending over to reach your feet? One of the most common problems all the above people are facing is the dependency for dressing themselves. Sometimes it is embarrassing to always ask from your spouse, child or nurse to help you put your socks on and what can you do if there is no one around you to help? This is a well-made, sturdy, very helpful and easy to use daily living aid. It features built-up foam handles, flexible plastic shell and a cord adjustable up to 35 inches to help you pull on socks or stockings if you have some sort of mobility impediment. 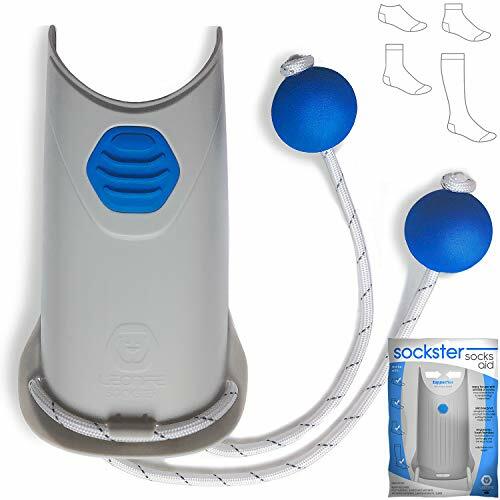 This sock helper tool is designed in a way that it reduces an individual's need to bend over when putting on socks, and therefore enables you to do more for yourself rather than bothering family members for such a simple task. ✔ Molded with high quality material, so this is durable and ideal for users with delicate skin. ✔ Sturdy ergonomic core with a flatter bottom ensures comfortable use. ✔ Flexible front wings and the tapper shape ensure easy loading of any sock. ✔ Adjustable cord is out of contact from the skin and allows reaching the floor when you're in a seated position. ✔ Ergonomically designed soft foam round handles for comfortable grip and easy pulling. ✔ Indestructable silicone pad releases the sock evenly by creating friction, so your socks are in the right place every time. ✔ Suitable for small to large foot sizes. ✔ Comes in a sealed bag. ✔ 100% satisfaction or your money back. No gimmicks. SO WHY WAIT? CLICK "ADD TO CART" BUTTON UP THERE AND JUST MAKE YOUR WISE CHOICE TODAY! ☆ THE NEW and EASY TO USE SOLUTION FOR PUTTING ON SOCKS. Leonfe Sockster Sock Aid is designed to make putting on your socks and stockings a breeze. It saves a great deal of time when dressing and make you independent if you are having mobility impairments. ☆ WORKS WITH MOST TYPE OF SOCKS. The tapper shape and flexible wings make it easy to load any kind of socks, from compression to sport ankle socks. Also, our sock slider offers perfect fit for different sized feet. ☆ TOP NOTCH QUALITY. Our sock puller tool is designed by top designers and medical professionals using the highest quality materials to ensure durability and longevity. The shell was ergonomically designed for men and women feet with a flexible cord that can be adjusted up to 35 inches, comes in a sealed package..
☆ PREMIUM BENEFITS OVER OTHERS. Molded plastic core with tapper flexible wings ensures easy loading of any socks and the indestructible rear silicone pad is designed to release the sock evenly. Soft, rounded foam handles are more comfortable for arthritic hands to grip, and the adjustable cord will not be in contact with your skin while using. ☆ BACKED BY 100% MONEY BACK GUARANTEE. Our customers are our lifeblood! So, in a rare case if you aren't "5 STARS HAPPY" simply let us know and enjoy 100% cash back. No questions. No small letters. SO JUST MAKE YOUR WISE CHOICE TODAY. If you have any questions about this product by Leonfe, contact us by completing and submitting the form below. If you are looking for a specif part number, please include it with your message.